The garden patch smash is a cocktail straight out of the garden. It is a very fresh, sweet, and delicious drink that mixes the taste of fresh berries with tequila and Dry Sparkling's lovely lavender soda, which is so much fun to mix with. The recipe requires a raspberry-lavender syrup. You will have to make that at home, but it's just as easy as any simple syrup. It is a very useful syrup that you can use all summer long to create fresh sodas with and without the booze. Dry's lavender soda is a must for this cocktail because it adds another layer of the fragrant herb to the mix and is not sweet like many other sodas. Fortunately, it's becoming easier to find in stores, and you can order it online. If you need a quick substitute, club soda will do, though you will be missing out on the extra lavender. Muddle the raspberries to release their juice and set aside. In a saucepan, bring the water and sugar to a boil, stirring constantly until all of the sugar is dissolved. Reduce the heat and add the raspberries and lavender. Cover the pan and simmer for 5 minutes. Remove from the heat and allow to cool and steep for about 2 hours. Check the flavor intensity and, if desired, allow the syrup to rest for longer. Fine strain to remove all of the lavender and berries. In a highball glass, muddle the blueberries and syrup. Add the tequila and lime juice, then fill with ice. Add acid phosphate (if using) and fill with lavender soda. 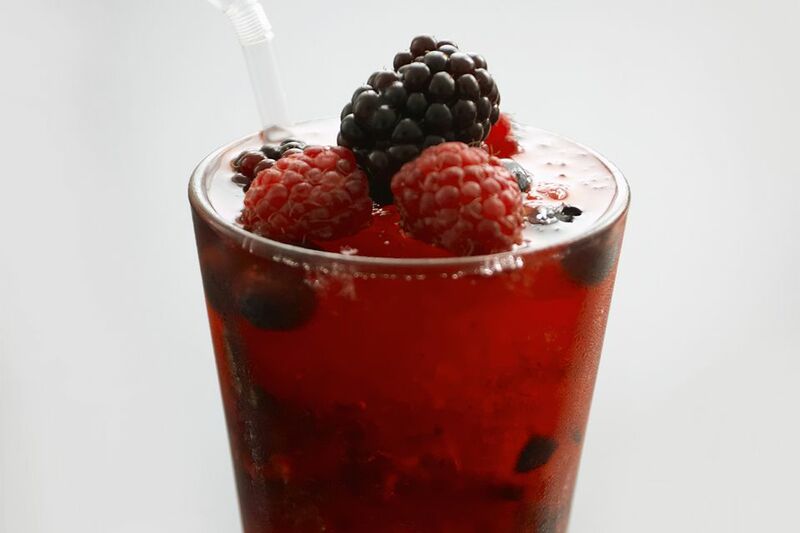 Garnish with a variety of berries. Though optional, the acid phosphate is highly recommended in this drink. As Darcy O'Neil points out in the book, "Fix the Pumps," it is a key ingredient in homemade sodas, bringing a subtle balance drinks. Just a few drops will make an amazing difference in an effect similar to using cocktail bitters. O'Neil sells a recreation of this old-time soda fountain ingredient under the Extinct Chemical Company brand directly from his Art of Drink website. Use it in sodas and citrus cocktails to add a subtle flavor enhancement. While tequila was the initial spirit of choice for this cocktail, it's also really nice with rum and vodka if you prefer one of those spirits. Add a very fun twist and another layer of fruit to this drink by using a mango-infused rum. How Strong Is a Garden Patch Smash? The garden patch smash is a nice casual cocktail that's light on the alcohol. When made with 80-proof tequila, it weighs in at just around 10 percent ABV (20 proof). That's perfect for a relaxing afternoon in your own garden! Tequila Takes Over the Bloody Mary and it is Fabulous!